We have the fine vintage guitars you’ve been looking for ﻿here at Gary’s Classic Guitars to either complete your collection or create your own music. The tone and style of our guitars simply cannot be matched which is why time and time again we sell high end rare and collectable vintage guitars to those who can truly love and appreciate them! Our satisfied customers range from high profile artists to the beginner guitar player looking to find something truly unique and amazing while learning the electric or acoustic guitar. There’s one thing these people have in common and that’s the fact they both have an appreciation for vintage guitars and know what a true classic is. Gary’s career selling vintage electric & acoustic guitars dates back more than three decades. Working with many top artists as well as avid collectors, Gary has maintained a reputation in the industry as trustworthy and easy to deal with. His policies include no hassle purchases. Another element to the success of Gary’s Guitars over the years is the fact that he stocks many of the most popular and the most rare guitars that are almost always sought after. You’ll be able to browse some of the most coveted models and have your very own chance at owning them just like your favorite guitar hero! Gary realizes that many people cannot afford to purchase many vintage guitars and many only one or two of these gems in their entire life. The good news is that Gary will not only treat every buyer just as he treats his high profile clients, but he will personally discuss options with you and give you the best value for your budget so that you can own the vintage classic guitar of your dreams. The passion Gary has for vintage guitars reflects in the quality of instruments he buys and sells on a regular basis. Meeting and interacting with guitar legends has given Gary a deep understanding of the industry and how artists connect with the electric and acoustic guitars they play. You’ll find a large variety of vintage guitars in Gary’s shop or check out the entire inventory easily online at his state of the art website. On the website you’ll find both photos and information about the classic guitars you may be interested in purchasing for yourself or a loved one. Do not miss your chance to own a piece of history and find one of the unique vintage guitars that Gary currently has for sale. There are types of classic vintage guitars available for everyone from the beginner collector to the veteran player. You’ll enjoy a large selection from the most popular and legendary guitar makers in addition to some one of a kind items highly coveted by collectors and artists alike. 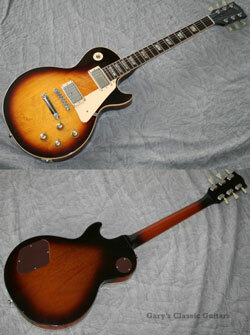 Check out the recently added vintage guitar selection on the homepage today! Gary regularly adds vintage guitar listings to his website so that every customer can have the chance to purchase. You know that you’re getting a high quality guitar that was personally hand-picked by Gary since he only stocks the most pristine quality and most coveted vintage guitars on the market today. One of the most important things you can do for your existing vintage guitar is to make sure that proper maintenance is performed when needed. There are a few things that should be done when your guitar is going in to storage or even if you’re just displaying on the wall for all to see. Sometimes this care depends on the individual type of guitar or preference of the owner, but ultimately the choice is yours whether or not you will take the time to care for your classic guitar or let it slowly deteriorate over time. Vintage guitars will eventually need to be serviced or repaired if they are not properly taken care of. Some beginner players and collectors do not know this and all the sudden when they recover a guitar from storage it’s no longer in pristine shape and expensive procedures that to be done in order to return it to good condition. All it takes is a little education before even a beginner can start to understand the true value of taking care of their vintage guitar or the years. One of the best things about purchasing rare vintage guitars today is that over time they will only increase in value. As long as the guitar you have is well taken care of over the years, chances are that in not much time at all (a few short years) your guitar could possibly be worth much more than it was when you purchased it. Some collectors view their vast vintage guitar collection as an investment as well as their passion. A great fact that holds true for many classic guitar collectors from Gibson to Fender and more is that they truly have a passion for what they collect and they know that many years in the future either their children or themselves will have a collection that is worth even more than it was when purchased! If a collection is purchased the smart way then the owner can gradually build up the quantity of guitars and have something quite valuable to pass on to future generations and continue the passion for vintage guitars that started it all. In addition to maintenance that must be done regularly while you are actively playing or displaying your vintage guitars, similarly there are steps that must be taken in order to properly store the guitars that you own. When planning on storing your guitars for just a few weeks or even several months up to several years there are important steps that, if ignored, will leave you with a much less valuable guitar. After learning the basics it will be much easier to keep your vintage guitars in great shape while in storage. The methods include certain temperatures, humidity, and more to ensure that the strings in addition to the wood and other precious parts of your vintage guitar do not become warped or damaged overtime while left in storage. Sometimes it’s inevitable that you’ll be in the position where your classic guitars must go into storage for whatever reason. This could be because of a move, downsize of living situation, or a wide range of other reasons. No matter what the reason is there needs to be some sort of preparation done to ensure that once your guitars are retrieved from storage that they are in just as perfect condition as when you initially put them in storage. Common places to store your vintage guitar collection range from the corner of an extra room, a storage unit, basement, or even a spare closet that you’re not using. All of these spaces, if prepped correctly, will make an adequate space to store one or many vintage guitars over a period of time. One of the most important things is to properly control the humidity and the temperature of the environment in which you store your guitars for an extended time. The humidity should be between 45-55 percent. As long as your guitars are stored within that range you should have minimal to no damage whatsoever as a result of extreme humidity. If your humidity is too high then you may want to use a dehumidifier and similar goes for a dry climate, use a humidifier to ensure that the air is not excessively dry. Similar to humidity it’s important to keep the temperate between 70-75 degrees Fahrenheit which equates to around 24 degrees Celsius. Extreme cold and extreme heat damage various components of the vintage guitar over just a short period of time. Another tip is to make sure that you loosen the strings if you’re p[planning on storing your guitars for several weeks or more. This will ensure that the neck is not damaged. The tips and information explained above is just the tip of the iceberg when it comes to purchasing, storing, using, and maintenance of your vintage guitars collection. Much of the information you receive will come from research about your specific types of guitars and tips from friends over the years. Thanks for taking the time to read through this guide and feel free to browse the website for more information and take a look at our current inventory of vintage guitars. From everyone here at Gary’s Guitars we would like to thank you for the support over the years and look forward to helping new and veteran collectors and musicians alike keep enjoying vintage classic guitars and all the fun and excitement that comes along with them!